If you have an important meeting coming your way and the success of your career hangs in the balance, making this get together extra special can go a long way. Catering your next business event can give your clients a great impression regarding your company. You’ll need to make sure you do it right and the best way is to hire a professional catering service. Here are five reasons why hiring a Detroit catering company is an excellent idea for your next business meeting. When you’re proud of your business, you want to exclaim it. As you guide your guests to the meeting room, they’ll get a good look at your facility and hard-working employees. If you have a professional and experienced catering service taking care of the preparations, you have the chance to spend a little extra time acting as a gracious host. Your clients will appreciate and be impressed by this special attention and thoughtful behavior. Before you negotiate with anyone’s business, you make sure to do a background check, right? The same should be done for your guest’s palate. This sort of gesture will translate as a genuine act of consideration. After all, it would be a shame if only half of your guests could eat the food that’s ordered. Doing business on an empty stomach isn’t preferred. If possible, determine if any of your clients or colleagues have a food allergy, and when you talk to your caterer about the menu, consider adding a wide variety of cuisine to accommodate all dietary lifestyles. True satisfaction and opportunity will lead to repeat business. If your guests request a specific menu, then appeal to it, but don’t be afraid to add something they may not expect. Doing this shows you strive to go above and beyond your guests’ expectations, but not in a way where it’s showing off. Instead, you are someone that utilizes the necessary resources to get the job done. If true professionalism and formality is your endgame, you’ll want to make sure the staff knows that. A professional catering service can offer staff to wait on you and your guests, and you’ll want to make sure they look the part. Most likely, professional caterers will add to the atmosphere you’re going for. Your guests will feel well taken care of and remember how capable you are at coordinating with style. A professional catering service can help with organizing, serving, and even decorating the food you ordered. Adding a formal style to the food that matches the theme of the event shows high quality presentation and careful planning. Your meeting will be immersive, creative, and can even add a personal connection. Your business associates will see you and your company as something that makes a good amount of work look almost effortless. 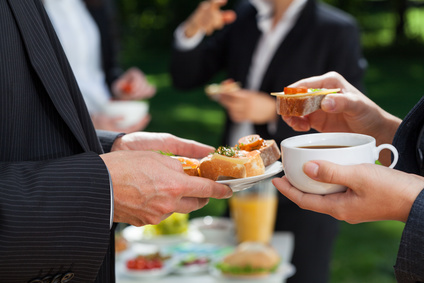 The benefits of a professional catering service can turn a simple meeting into a home run. Whether it’s with a client, another business, or your employees, you’re sure to benefit from going the extra mile. Without breaking the bank, you will profit from making this decision. If you live in the Detroit area and need a catering service soon, contact David Graham Events for a quote.